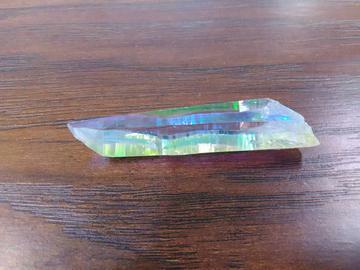 Angel Aura Quartz and sometimes called Opal Aura. Angel Aura is quartz that has been bonded with Silver & Platinum. Angel Aura Quartz is a bridge to channeling higher knowledge, remembering past lives and gaining insight into one’s spiritual mission in this lifetime. This stone carries all the wonderful properties of clear quartz such as focusing, amplifying and transferring energy, and when mixed with the platinum and silver is one of the best stones for clearing and brightening the aura, stimulating and clearing all of the Chakras.